Frac Balls: Which Material Is Optimal? Hydraulic fracturing AKA “fracking” is the key to the surge in North American oil and gas development in the past decade especially in the U.S. shale gas/tight oil regions. In simple terms, fracking creates small fissures underground which allow trapped oil and gas to flow into the well-bore and be collected. As part of the process, engineers will be required at times to build up pressure in a certain area of the well to cause fracturing in a specific area. The implements used are called “frac balls” and several types of plastic have been used in this application including G-10 laminate (and other thermosets), Polyamide-Imide (PAI), PEEK and other thermoplastics. 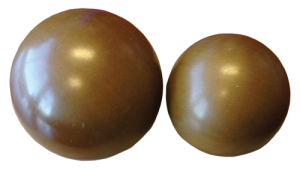 These balls are packed into “frac ports” in specific areas and are pushed into a sleeve in descending order from the largest diameter ball to the smallest. When fracturing occurs, the balls are pushed down the line into a new sleeve. The benefit of this process is that it permits multiple fractures, at targeted points. The selection of frac ball material is often left to the engineer, but PAI and G-10 are probably the most common materials used in this application. But which is better? The answer is PAI. G-10 frac balls have a pronounced “directional bias” this is because the balls are made from a laminated “sandwich” sheet. In practice, this results in varying properties for the G-10 frac ball depending on the orientation it lands in the sleeve with the operation pressure for the ball ranging from around 4,000-10,000 PSI. The higher the pressure needed means the higher chance a G-10 ball will fail. PAI, as one of the highest performance plastics available, offers more consistency. PAI is tougher than G-10 and can handle higher pressures (18,000-22,000 PSI). Since it is not a laminated material, the orientation of a PAI frac ball will not affect its performance. PAI also has a very high operating temperature of 260 degrees Celsius (500 degrees F).